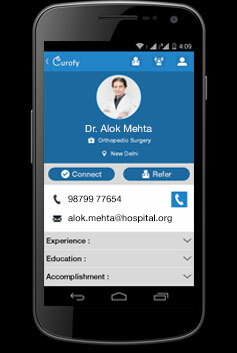 Gurgaon-based 911 India Healthcare Pvt Ltd, which owns doctors networking app Curofy, has secured an undisclosed amount in pre-Series A funding from US-based venture capital firm RoundGlass Partners. The social network will deploy the money for product development, marketing and hiring resources, said co-founder Nipun Goyal. “They (RoundGlass Partners) are an extremely seasoned team that can provide us with both financial support and deep healthcare expertise. Over the last few months, we have monitored and tracked data patterns from daily activities of our users. We will use this data to further personalise our app and offer improved experience to our customers," Goyal told VCCircle. Curofy was founded by IIT Delhi alumni Mudit Vijayvergiya, Pawan Gupta and Goyal. It’s an app-only platform that allows doctors to interact and collaborate on cases, apply for jobs and read latest medical news. The startup’s medical directory pre-populates doctors' profiles based on public data. Curofy, which was officially launched in February 2015, claims to have about 10,000 registered doctors from over 70 cities on its platform. The company had raised funding last year at a reality television-type formatted live event called TiE the Knot at TiEcon 2014, a conference organised by The Indus Entrepreneurs. The startup also secured angel funding of roughly $160,000 from India Quotient, Spice Labs and a bunch of angel investors. “With the rapid pace of medical advancement, it is challenging for practicing physicians to stay informed on the latest methodologies and research while simultaneously connecting with colleagues to share best practices," said Gurpreet Singh, founder, RoundGlass Partners. "The Curofy app… is making it easy for physicians to share knowledge and holistically manage patient care." Curofy would compete with other social networking ventures such as DocPlexus and PlexusMD for attracting doctors. Early this week, DocPlexus secured about $700,000 in seed funding from Uniqorn Ventures and Austria-based ASP Consulting. RoundGlass Partners is a Seattle-based VC firm that focuses on healthcare technology startups. As per VCCedge, the data and research platform of VCCircle, the Curofy investment would be RoundGlass’ third known bet in India. In August, RoundGlass put $1 million in Uber Health Tech Pvt Ltd, a startup that builds social wellness apps for corporate staffers under the brand Zoojoo.be. Earlier, the VC firm joined hands with Flipkart co-founders Sachin Bansal and Binny Bansal and others to invest $2.3 million in medical technology startup Wrig Nanosystems.